T-minus three hours until the noon deadline for the manual recount to end, counties to submit their final votes, and for Bill Nelson to yet again make a choice. Be remembered as the statesman who graciously conceded after 42-years of public service… or be remembered as the sore loser who refused to face the people he served. As Florida’s recount comes to a conclusion Sunday, pressure is firmly on Democratic Sen. Bill Nelson. 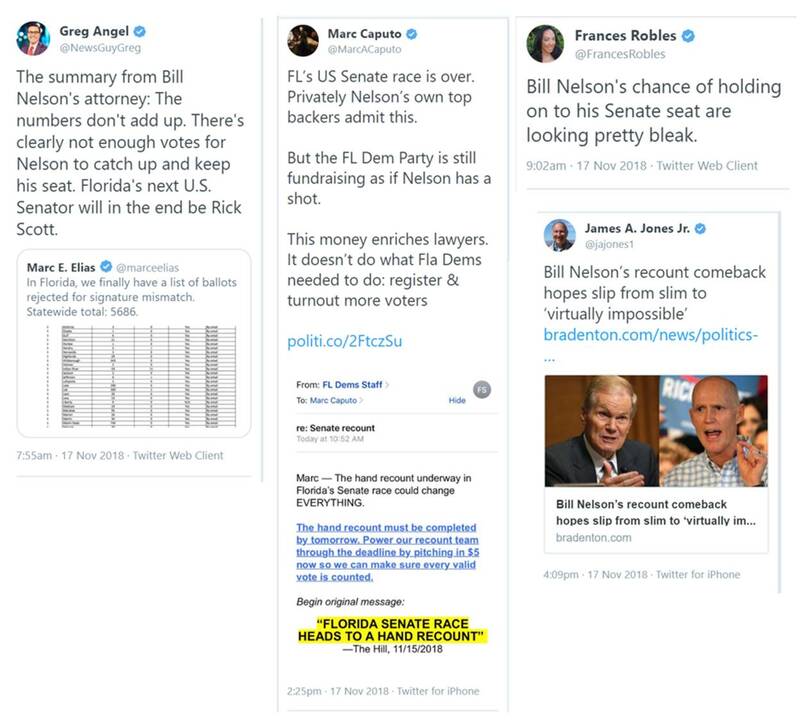 … Nelson lost a partner in the recount fight when Mayor Andrew Gillum, the Democratic gubernatorial candidate in Florida, conceded to Republican Ron DeSantis, a sign that Democrats in the state believe the fight is over. Nelson’s race — along with Gillum’s contest and the state’s race for agriculture commissioner — went to a machine recount a week ago, but the recount did not do nearly enough for Nelson and just further formalized Gov. Rick Scott’s more than 12,000-vote lead. Despite Nelson’s campaign — led by lawyer Marc Elias — being the muscle behind Democratic efforts to extend the recount, the senator himself has done very little publicly, appearing only a few times in taped videos and once with Senate Minority Leader Chuck Schumer in Washington.